During installation, you configured Novell Vibe to communicate with your e-mail system, as described in Gathering Outbound E-Mail Information in Basic Installation in the Novell Vibe 3.4 Installation Guide. As a result, Vibe users can send e-mail messages to other Vibe users and to anyone whose e-mail address they know. They can also send e-mail notifications when they create workspaces, add folder entries, and so on. In addition to this basic e-mail functionality, you can configure your Vibe site so that users can receive folder digests of site activity that are created and sent to the users who have subscribed to the folders. Click the Administration icon in the upper right corner of the page. Under System, click Configure E-Mail. By default, folder digests are compiled and sent daily at fifteen minutes after midnight. Adjust the schedule as needed to meet the needs of the majority of your Vibe users. 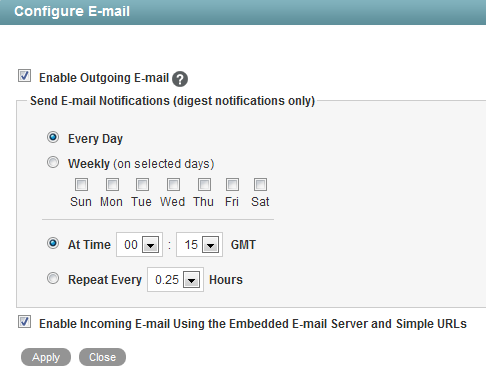 Users can turn the digests on and off for individual folders, but they cannot change the e-mail schedule that you establish. Click Apply to save the settings, then click Close. For information about the options that users have for receiving e-mail notifications, see Subscribing to a Folder or Entry in Getting Informed in the Novell Vibe 3.4 User Guide.